FA: “Jersey” Dave Littman and Jeff Herrick, 6/05. Aries Butte is the northern of two domes on the ridge that separates Petroglyph Canyon (1.4 miles east of the small tunnel) and Jug Handle Canyon (two miles east of the small tunnel). Either one of those two canyons can be used as an access point. Both Petroglyph and Jug Handle Canyons have paved pullouts at their respective mouths. 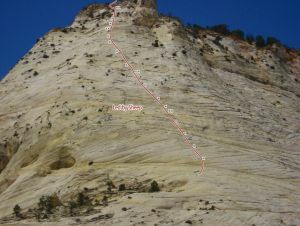 Led by Sheep ascends the southeast ridge of the Aries Butte formation. The route faces south/southeast and follows the path of least resistance for five pitches. Every belay is a bomber two-bolt belay with chains. The climbing is protected by bolts and can be slightly run out in places but mostly on very easy terrain. The climbing community thanks Jeffe’ and Jersey for creating such a unique, lower-angle route in Zion. This is a great adventure for an experienced climber to take a beginner on. Approach: The walk up Petroglyph Canyon is fairly casual. To find the climb, walk north from the paved pullout and drop into the canyon. Follow the bottom of the canyon for about 500 yards past the petroglyph panels on your left until the canyon starts to pinch off and get steep. Exit the bottom of the canyon on the right and continue up the slickrock slabs to the saddle between the two prominent peaks to the east. From the saddle, walk out a ramp that curls around on the east face of A.B. (this ramp dissolves into the slab and becomes progressively more exposed the farther north you walk) and rope up at an exposed ledge with a couple small pinions. Rack: Can be climbed using just ten long slings with biners and two 60m ropes. Some parties may opt to beef up their rack with small to medium nuts and cams .5- 1”. Descent: rappel the route using two 60m ropes. Which SuperTopo guidebooks include a topo for Led By Sheep?